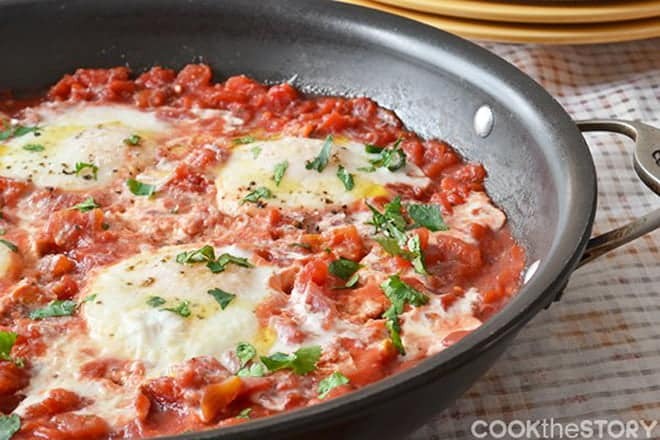 For this easy egg recipe, eggs are simmered in a hearty tomato sauce before being drizzled with olive oil, spattered with parsley and sprinkled with Parmesan cheese. Super easy. Super delicious. This is my favorite go-to breakfast when I have company. 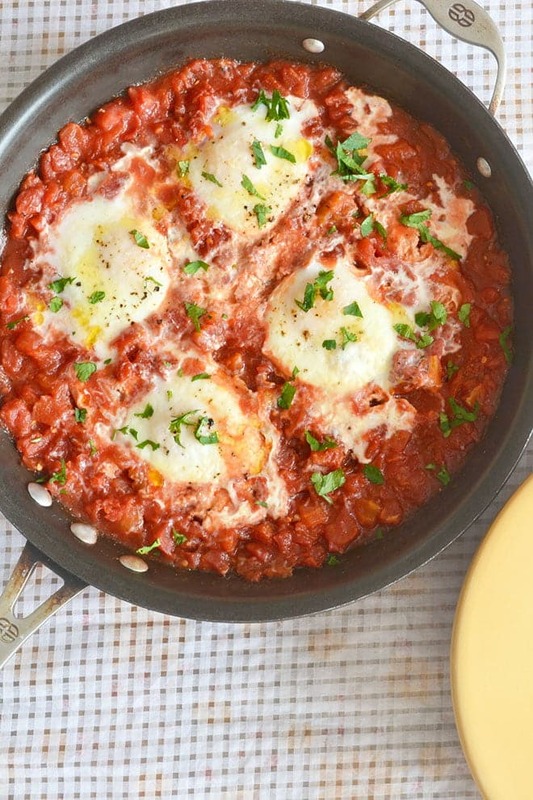 The eggs are poached in a rich, Italian tomato sauce, and topped off with Parmesan cheese. To finish, the whole pan gets a wake up call with the sprinkle of fresh parsley. Eggs cooked in a hearty tomato sauce? Doesn’t that sound simple and charming? Can you hear yourself whispering, “Let’s do that”? Yes? I thought so. To start this recipe, you pour a whole can of tomatoes right in the pan with the seasonings. When you hear the pan burbling turn down the heat and crack in some eggs. Cover the pan so that the eggs can set. Then, slice some bread so you’re ready to sop up the tomato goodness. Just before you eat, drizzle olive oil over everything and sprinkle it with shredded Parmesan. A quick snip snap of kitchen shears lands some parsley in place. This dish is as simple as it is delicious. Relax and drink your coffee as it easily comes together on the stove. Eggs are simmered in a hearty tomato sauce before being drizzled with olive oil, spattered with parsley and sprinkled with Parmesan cheese. Pour the can of tomatoes with their juice into a large skillet. Add 1/2 teaspoon of salt, 1/4 teaspoon of coarse black pepper, the red pepper flakes, and the oregano. Warm it over medium-high heat until it starts burbling. Reduce the heat to low and simmer the sauce for 5 minutes. Taste. Add more salt if needed. Use the back of a spoon to nudge some tomatoes apart. Carefully crack an egg into the liquid where the tomatoes used to be. Make space for another egg and then crack it in. Repeat with the remaining eggs. The eggs should not be submerged but should be nestled among the tomatoes. Increase the heat to medium-low and cover the skillet. Cook for 7-10 minutes, until the whites have solidified but the yolks are still runny. Note that with my stove and my skillet I have to turn the pan periodically so that the eggs heat evenly and cook in the same amount of time. You may need to do the same. 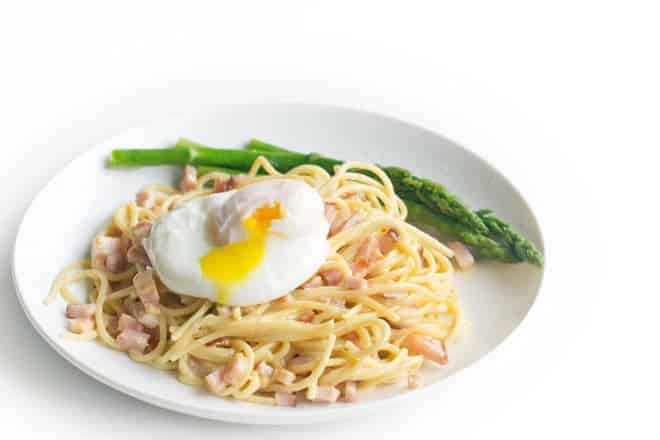 When the eggs are cooked to the desired doneness, drizzle each egg with 1/4 teaspoon of the olive oil, top with a small pinch of coarse black pepper and one-quarter of the Parmesan cheese. Sprinkle the parsley over top of everything. 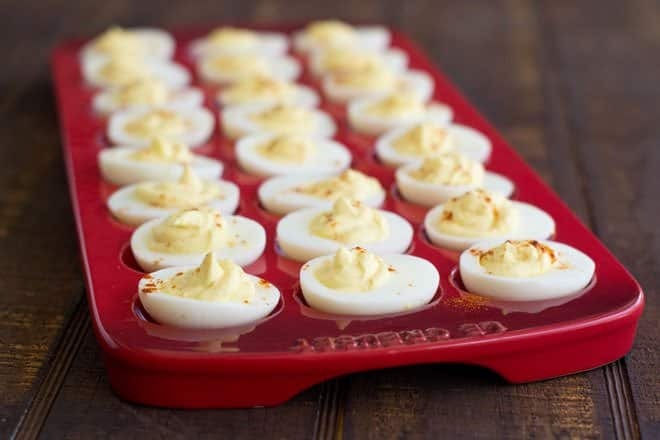 Use a big serving spoon to scoop the eggs along with sauce onto plates. 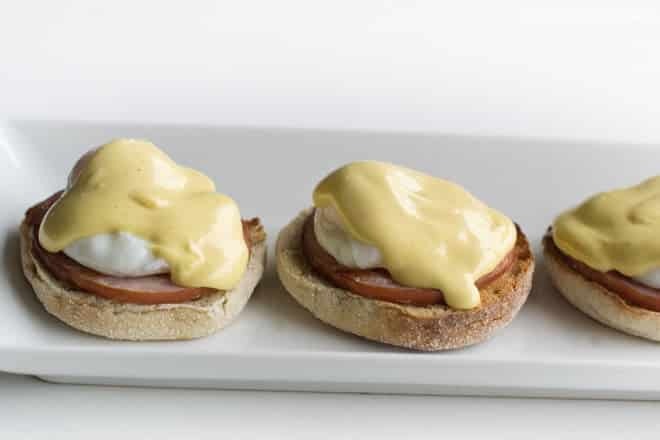 Make sure there’s something toast or bread-like around to dip into the eggs and soak up the sauce. This recipe was originally part of Brunch Week 2013, when a group of bloggers got together to all share their favorite brunch recipes on their sites. 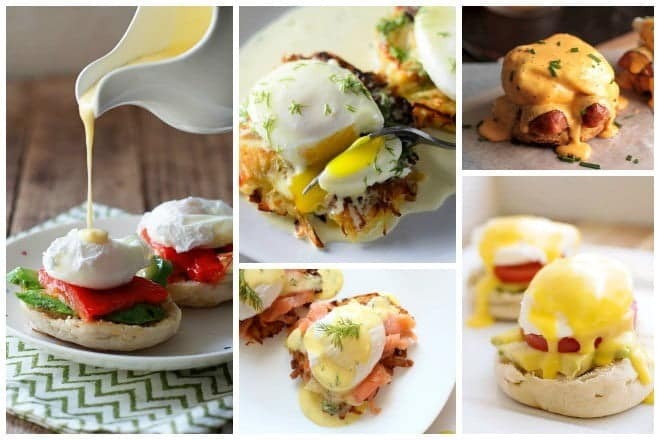 Here are links to brunch recipes from some of the other brunch weekers shared. This post originally appeared in May, 2013. It was revised and republished in April, 2018.
examine how food reacts under different exposures to heat. Breakfast, Dessert, Main Dishes, Chicken, No Thawing Required, Pasta, Pork, and more. ummm this sounds divine and your story makes it even more amazing! I love that you were channeling your inner domestic goddess! I think one would be considered a freak of nature if they were like this 24-7! Must try this recipe sometime soon. Love the idea of serving it with garlic bread! Crikey, I’d almost forgotten about this one Christine, thanks for the share. This is perfect morning after food too. My dad, who was French used to do something very similar when I was a kid, he used ratatouille as the base and dropped whatever cheese we had on the top. It basically works great with day old sauce and yesterday’s bread, for a real Meditteranean breakfast. I have always wanted to make eggs like this, they look amazing!! Oh my goodness, this is one of my favorite types of breakfasts ever! (Anything that involves poached eggs + tomatoes.) 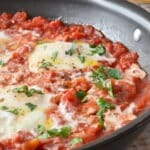 It’s like an Italian version of Shakshouka! I have an Indian (Parsi) spiced version of this on my blog, too. Yours looks absolutely perfect and gorgeous! I love it. This is the type of breakfast I would die to see on my table the moment I wake up! What a yummy idea! I need to try this! And of course you were awesome! I was totally impressed as an overnight guest. Nah, I failed you my friend. I misread your email about food allergies etc and thought you couldn’t have dairy CHEESE not DAIRY PERIOD. And so there was dairy in almost every part of our meal. But no dairy cheese! Not that that helped you be able to eat it. I felt awful. But it was fun. (Did we even have breakfast the next morning. I had a headache. No memory).